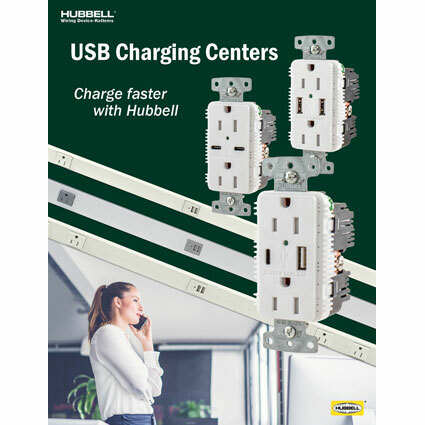 A new USB Charging Centers guide from Hubbell Wiring Device-Kellems connects customers with the Hubbell devices that allow safe, fast, and efficient charging. With trends like BYOD and Internet of Things transforming the spaces we use for work, rest, travel, and entertainment, people now expect access to fast charging power – anywhere, any time. Not only does the guide showcase the benefits of Hubbell’s USB outlets and receptacles, but it also explains the advantages of USB charging and outlines the features of the newest standard for USB charging: USB Type-C.
Hubbell USB charger solutions are built to last, providing clean, stable power that recharges all types of devices quickly. The stainless steel USB ports are rated for a minimum of 10,000 insertions and removals; they’re designed to last for years. Each charger incorporates a transformer that “steps down” 120V AC power to DC power to ensure clean power with inherent surge protection. As a result, USB chargers can be used on AFCI and GFCI protected circuits without any interference problems. For more information about the USB Charging Centers guide, or to obtain a copy, contact your Hubbell sales representative or visit www.hubbell.com/wiringdevice-kellems/en.